"saving the world one contact at a time"
Our goal is to partner with each and every customer by offering complete mechanical contracting services from design and installation to program maintenance and service, optimizing performance, useful life, and maximize value from their mechanical assets. HVAC systems are valuable assets to any business. Properly designed, installed and maintained HVAC systems are vital to a company's success in today's market place. A properly functioning building heating and ventilation system not only provides comfort to those living and working in the space, but also improves moral, productivity and efficiency. 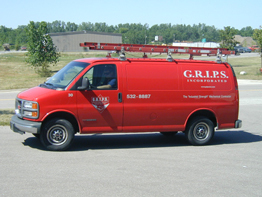 At G.R.I.P.S., Inc. we recognize the important role of these systems. Therefore, we take pride in being a company that acts with professionalism to install and service a mechanical system that meets and exceeds your expectations both in quality and value.